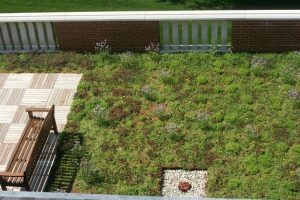 A Vegetative “Green” roofing system from a Boston green roof contractor is a roof of a building which has been partially or completely covered with vegetation and a growing medium, planted over a waterproofing membrane. These systems also may consist of additional layers such as root barriers, drainage and irrigation systems. The “green” term is generally referred to as the growing trend of being environmentally friendly. Eagle Rivet Roof Services is experienced in installing cutting edge green/vegetative roof systems. Plant life over the roof surface provides a positive environmental impact in several ways. It converts the carbon dioxide which we all breathe out to the oxygen which we all breathe in. It reduces the urban heat island effect by replacing roof surfaces that absorb heat to and give it off to the surrounding area to surfaces which are neutral in their heat absorption. The soil absorbs and slows storm water runoff which eases the strain on municipal storm water drainage systems. And finally, they provide an area of respite for building occupants which otherwise might gaze upon an unattractive commercial roof system. Often, walking paths and gathering areas are provided on green roof systems which provide an outdoor sanctuary to office workers. 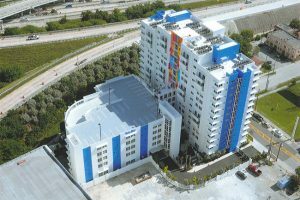 Eagle Rivet can provide stand alone green roof design and build installations or can work with your design professional or general contractor. Please contact us to see how a green roof system can enhance the value of your facility. 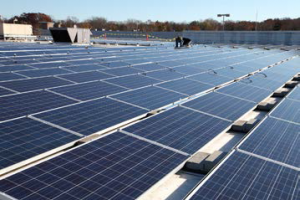 Eagle Rivet also wants to assist in your eco-friendly efforts at the end of your roof’s life cycle. We invite you to take advantage of our strategic industry recycling partnership before you begin your next roof tear-off project.